Kodatei, or A-un-no-seki-tei (the Stone Garden of A-Un) is a small garden in the Ryogen-in subtemple, part of the Daitoku-ji complex. It is long and narrow, with raked gravel around two stones taken from the Toyotomi Hideyoshi's Jurakudai Palace (one of the two stones in the photo above). 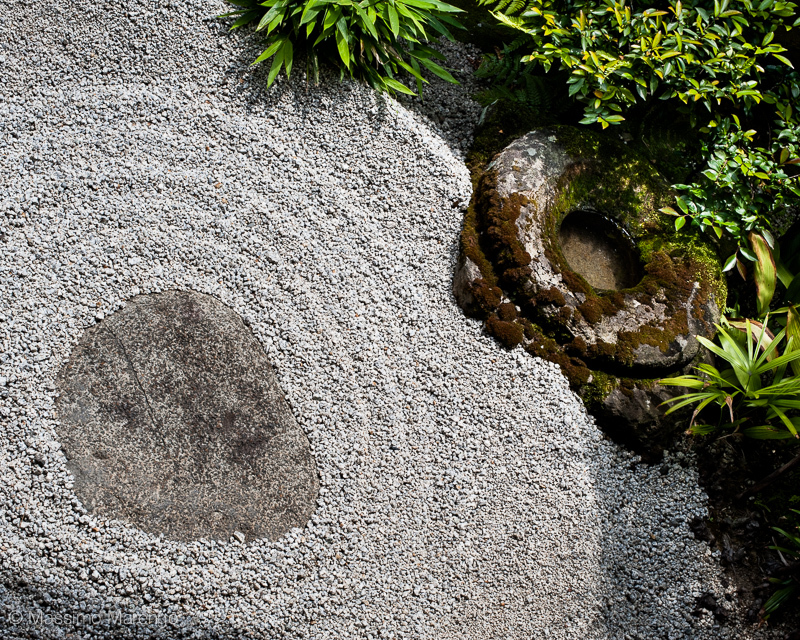 It is Mayli's favorite zen garden, and we spent a good deal of time in there. The garden represents a-un. A-un is a japanese transliteration of the "aum" syllable ("om", does this ring a bell?). Sacred in Hinduism, Buddhism and Jainism, it is the composite of the first and last letter of the alphabet (the first sound pronounced by a newborn infant, and the last sound pronounced while exhaling the last breath). A-un represent the beginning and the end, and all that is complementary. A-un represents the truth of the Universe.